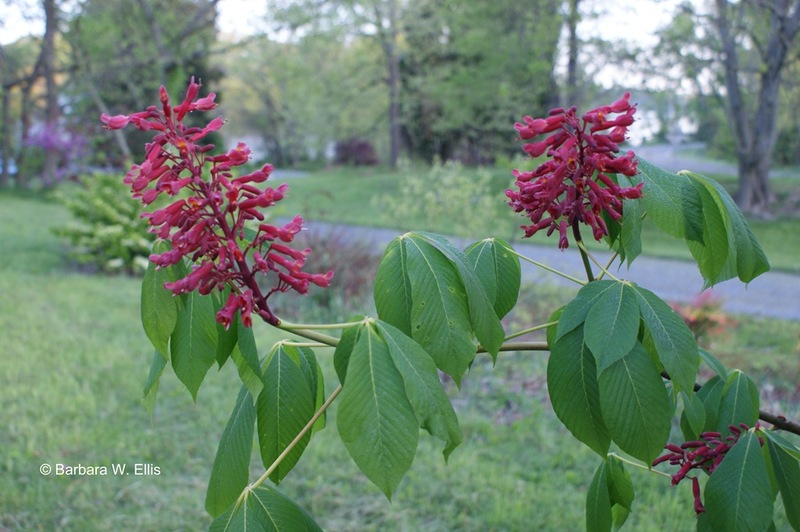 Whether you call it a small tree or a large shrub, red buckeye is a handsome ornamental that should be grown more often. Like others of its kind, my plant is multi-stemmed clump with an overall rounded habit. If the books are correct, mine still has a bit of growing to do. Mature plants range from 10 to 25 feet in gardens and spread from 10 to about 20 feet. Currently, mine is about 8 or 9 feet tall and wide. The champion listed in the National Register of Big Trees was 48 feet tall and 38 feet wide in 2009. Foliage is dark green and the plants don’t exhibit any fall color worth mentioning. However, the leaves emerge early and are fully extended by the time the red flowers appear. This puts red buckeye well ahead of many other deciduous trees, including willow oaks and red maples. Each leaf has five to seven leaves arranged in a palmate fashion, like the fingers on a hand. Individual leaflets are 3 to 6 inches long. The flowers are followed by round, brown nuts that are eaten by various mammals. This eastern U.S. native isn’t as common in cultivation as you might expect. A major reason for this is that the plants are relatively slow growing, since they concentrate on producing deep tap roots during their first few years of growth. As a result, red buckeyes frequently get passed over by nursery owners looking for inventory that will grow into salable size more quickly. The carrotlike tap roots also mean the plants demand a large pot in relation to a relatively small amount of topgrowth—another characteristic that keeps nursery goers from snapping them up. Red buckeye is easy from seed, and seedlings have appeared around my main plant. Simply pot up the nuts in fall or dig the seedlings in early spring. If you’re transplanting, be sure to dig deep. Seedlings will survive if you cut off part of the taproot, but the more of it you get the better your chances. Give red buckeyes a site in full sun to partial shade. They tolerate shade, but need at least 3 to 4 hours of sun per day in order to bloom well. Give them average to rich soil that is moist but well drained. Transplant in late winter to early spring, and prepare to be patient. Give plants a couple of years to get established and they’ll reward you with an annual show. 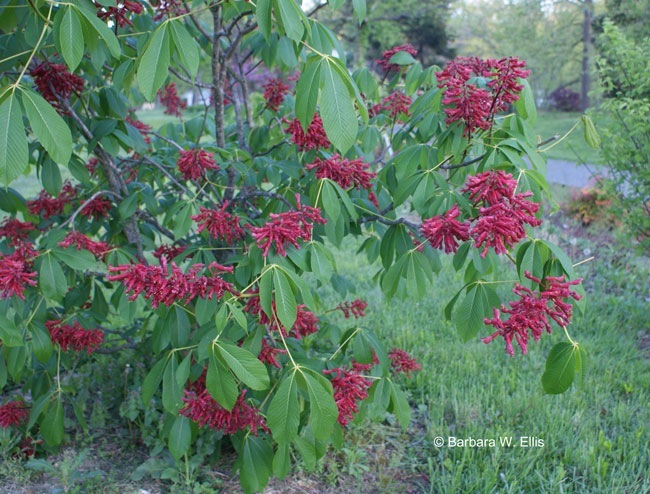 Red buckeye makes a handsome specimen plant, either alone in a lawn or underplanted with ground covers. Also try using it as a focal point in a shrub border or as an accent near a patio, so you can sit and enjoy the hummingbirds that visit. Stunning plant. 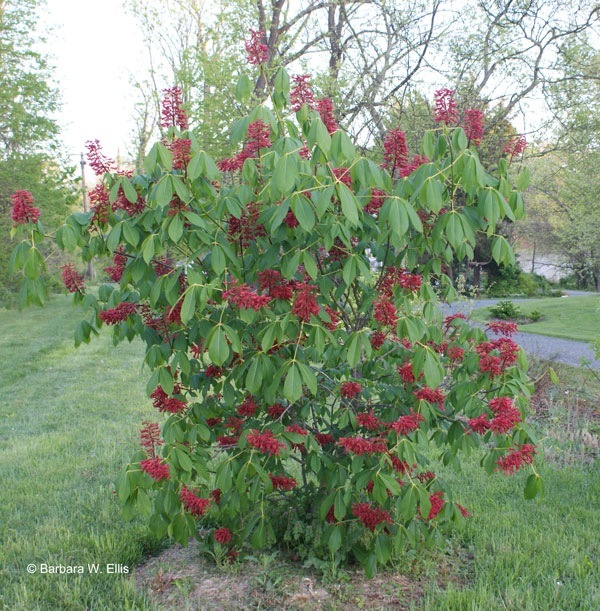 Are you familiar with the bottlebrush buckeye as well? Large, 20 high and wide, with 2 ft long “bottle brush” flower stalks. Fantastic. Buckeye is a great idea. I am moving to a large sunny location, and this might be a great choice for some privacy plantings – thanks! It is a stunner, isn’t it? I do have bottlebrush buckeye (Aesculus parviflora) as well. It is an all-time favorite, especially since it blooms in summer when not much else is going on in the garden. I’ve got a few plants in, but am waiting for them to get some size on them. As always with buckeyes, they take their time. Can’t wait until mine get going. At Longwood, they have a clump of bottlebrush buckeyes that is the size of a city block! Very complete information. I am looking forward to watching mine mature. I am sure you will enjoy it! Mine is prettier every year. If anyone is ever on the historic grounds of University of Virginia, there is a specimen tree at least 30′ tall near the 500 block of Alderman Road, Charlottesville, VA. It really is a fabulous tree. One of my favorites. We have a small (10 yr. old) one in our back yard. Hoping to live long enough to see it 20′ tall! Wow, sounds like a fabulous specimen. Thanks for sharing this! I looked up the species again in Dirr’s Manual of Woody Landscape Plants, and he says it can reach 30 to 36 feet in the wild. Dirr listed co-National Champion trees, one in Roanoke, Virginia and another in Kalamazoo County, Michigan in his 1998 edition of the book. In the 2014 National Register of Big Trees (https://www.americanforests.org/wp-content/uploads/2012/04/BT-Register-PDF_FINAL_web.pdf), co-champions are again listed, but this time, both are in Roanoke, Virginia.